Geometry students at the Lead-Deadwood High School in South Dakota have completed an unusual project with a very important mission. Geometry students at the Lead-Deadwood High School in South Dakota have completed an unusual project with a very important mission. 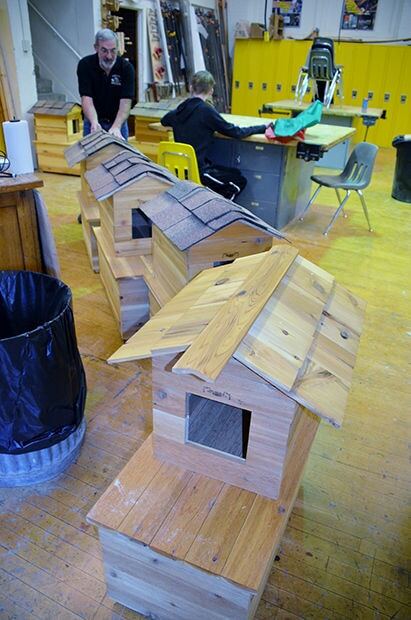 Students built wooden cat houses which will go to benefit feral cats. The project is the result of a partnership between the school and the Twin City Animal Shelter. The animal shelter purchased the materials required for the houses, which amounts to about $60 per house. Then, the students performed the labor for free. The cat houses will be available at the shelter, and people can come and get the houses for outdoor or feral cats to use. The houses provide outdoor cats with the important protection from the weather that they need in the winter. The partnership between the high school and the animal shelter is a great idea. Students learn about how to build and use tools, while putting their skills to good use that benefits outdoor cats in their community.